“You just came back from dog jail, huh?” Aunt Nunu nudged my arm. Born on September 6, 2016 in Morristown, NJ, Mylo spent his first few weeks frolicking with other Seeing Eye puppies. At about eight weeks old, he joined the home of his puppy raisers, a family that volunteered their time and energy to teach him social skills. The family welcomed him into every aspect of their lives, taking him to restaurants, doctor’s visits, and sporting events. Through a careful balance of positive reinforcement, correction, and patience, they transformed a rambunctious puppy into a well-behaved young dog. After fifteen months, Mylo returned to The Seeing Eye to continue his training. A fabulous instructor named Joy McDougal began teaching Mylo how to guide. She taught him to stop at stairs, move around obstacles, stop at curbs, cross streets, and stop for oncoming cars. Mylo and I met for the first time on June 29 at The Seeing Eye campus. He bounded over to me and began licking my face. The gesture shocked me; my first guide, Maxine, would never do that. Mylo and I began learning about each other. Brooke Donaldson, our patient and talented instructor, worked with us over the three weeks. She took us to New York City twice, and Mylo excelled. If he can thrive in New York, he can thrive anywhere. Beside me, my father lunged forward to catch my little cousin. Too late. The toddler snatched a cup from the table and poured the drink on Mylo. As Mylo slowly rose to his feet, the drink’s odor finally reached my nostrils. Whiskey. Seeing Eye dogs have the ability to stay calm in all kinds of situations, from the rattle of New York subways to the stares of taunting cats. The Seeing Eye has two cats, Nash and Crosby, who roamed the halls trying to distract the dogs. Mylo walked right past the cats. Although, there was one incident where a cat bullied him; for a moment there we thought Mylo might need a psycatrist. This week marks the twenty-eighth anniversary of the Americans with Disabilities Act, a comprehensive civil rights law that prohibits places of public accommodation from denying access to people with disabilities and our service dogs. Anywhere the public can go, service dogs can go. 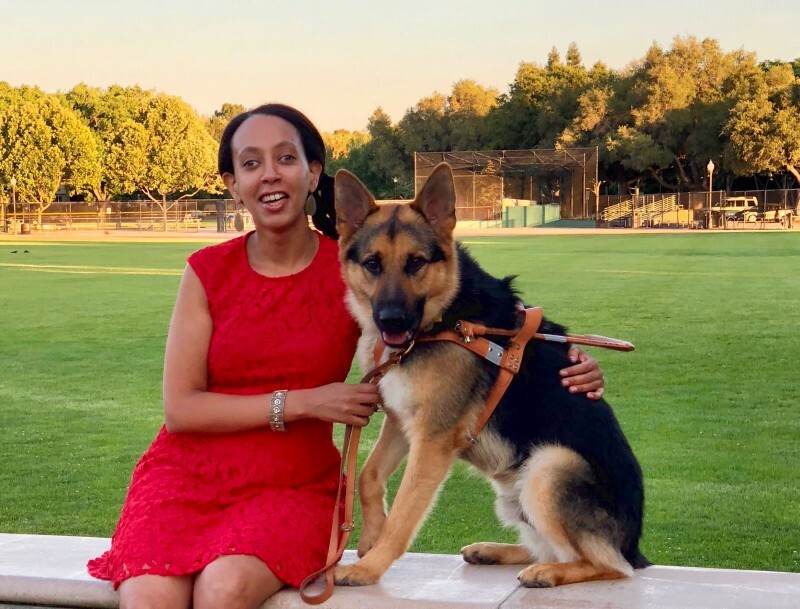 The law protects dogs that are specially trained to assist a person with a disability, which includes visual, hearing, mobility, and psychiatric disabilities. This Sunday will be my thirtieth birthday, and Mylo is an incredible gift. It truly took a village to raise this Seeing Eye dog: the puppy raisers, the instructors, the veterinarians, the school coordinators, and the donors who fund the program. Sending so much gratitude to The Seeing Eye community! Photo: Haben and Mylo are sitting on a bench. Mylo is a black and tan medium-sized German Shepherd dog. He’s wearing a leather harness, and Haben is holding his leash. Behind them is a large grassy field with trees in the distance.